Reading and share top 5 famous quotes and sayings about Scary Stories by famous authors and people. 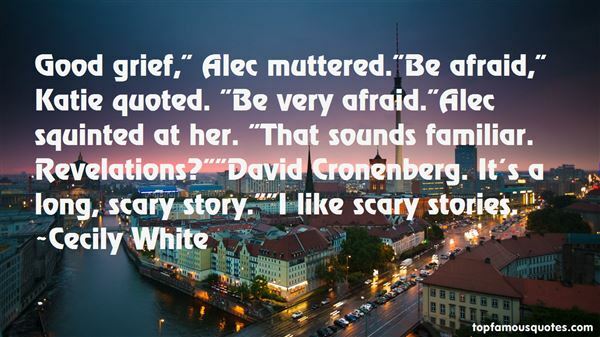 Browse top 5 famous quotes and sayings about Scary Stories by most favorite authors. 1. "We went to a church that had missionaries who'd come back once a year from Fiji & give talks. I remember one of them saying it was very hard work telling people they were going to lose their everlasting souls if they didn't shape up. 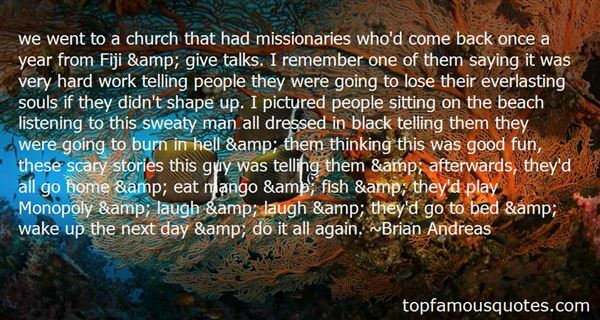 I pictured people sitting on the beach listening to this sweaty man all dressed in black telling them they were going to burn in hell & them thinking this was good fun, these scary stories this guy was telling them & afterwards, they'd all go home & eat mango & fish & they'd play Monopoly & laugh & laugh & they'd go to bed & wake up the next day & do it all again." 2. "Good grief," Alec muttered. "Be afraid," Katie quoted. "Be very afraid. "Alec squinted at her. "That sounds familiar. Revelations? ""David Cronenberg. It's a long, scary story. ""I like scary stories." 3. "… we have bad dreamsbecause our brain is trying to protect us… If we can figure out a way to beat the imaginary monsters … Then the real monsters don't seem so scary… That's why we like reading scary stories." 4. "Do you like scary stories? he asked ominously.Jacob Black"
5. 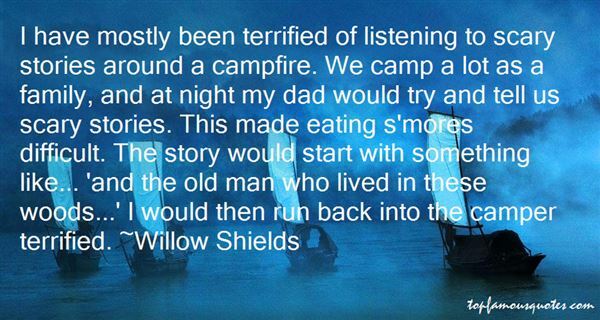 "I have mostly been terrified of listening to scary stories around a campfire. We camp a lot as a family, and at night my dad would try and tell us scary stories. This made eating s'mores difficult. The story would start with something like... 'and the old man who lived in these woods...' I would then run back into the camper terrified." It's unnerving how you fit in the basin of my thighs."